Dragon separates from Falcon 9 during March 1 launch (Credits: SpaceX). On its last trip to the International Space Station (ISS), the SpaceX Falcon 9 rocket lost an engine in ascent, losing a little performance but achieving orbit anyway. 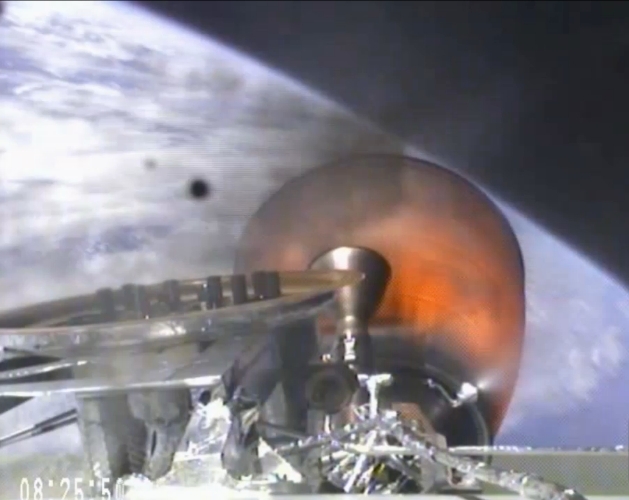 On Friday’s flight, the Falcon seems to have performed flawlessly in delivering the Dragon capsule to orbit. This time, it was the Dragon itself that failed, at least initially. Normally, after initial orbit insertion the solar panels would be deployed, but SpaceX personnel delayed deployment because they were having problems with the orbital maneuvering thrusters needed to circularize the orbit and to match it with that of the ISS. Only one of the four was working, and NASA rules required at least three of them to be functional before attempting an approach to the station. a forfeiture of at least part if not all of the payment for the flight. It may also have resulted in the loss of the vehicle if the propulsion system was unable to perform a proper entry or orientation, with the vehicle potentially burning up in the upper atmosphere. 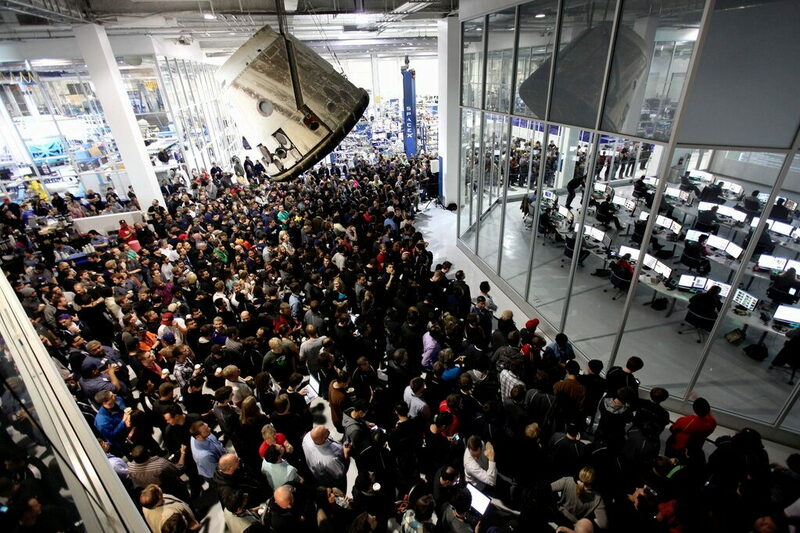 SpaceX employees watch the launch from outside SpaceX mission control (Credits: SpaceX). But shortly after, they made the decision to deploy the arrays while they worked the propulsion issue. Eventually, after cycling the valves and blasting them with pressurant to clean them out, first one more propulsion pod came up, and then the other two. The working theory as of this writing was that it was frozen oxidizer in one of the lines. By late afternoon they were go for rendezvous with ISS, though the delay cost them their window for their planned berthing early Saturday morning, pushing it off until Sunday instead. The company celebrated a slightly belated but happy “berth day,” with a delivery of a ton of equipment and supplies — with a bonus of fresh fruit — to the ISS crew. Like that of the previous flight, it was a valuable failure in that it identified a potential problem with either the design or operations but didn’t cost them the mission. On the first successful Dragon flight, Elon Musk, the company’s founder and chief executive, noted that it made him a little nervous because it was almost too perfect, and provided nothing to learn from or room for improvement. indicated a potential problem with the Merlin 1C engine design or procedures, but validated the designed ability of the vehicle to complete its mission with engine out. Unfortunately, that particular lesson had a short shelf life — Friday’s flight was the last for that version. All Falcon 9s going forward will be larger, with more powerful and simple (and presumably reliable) Merlin 1D engines with more performance. But the general knowledge will be carried forward into that vehicle, and it will be a good gradual evolution from the early successful version. This latest glitch not only pointed out a potential issue for the Dragon, but demonstrated once again (as had been seen in the rapid turnarounds on the pad after aborts on previous flights) the team’s ability to quickly diagnose and to make decisions to ensure ultimate mission success. If the current theory of the cause of the problem is correct, it may also result in a change in either design or processing procedures to ensure that propellant temperatures don’t get out of spec. Either way, the company has once again demonstrated the robustness of their designs and operations, building on the lessons learned from their many early failed launch attempts of the Falcon 1 which eventually resulted in a successful vehicle. This will likely give NASA continued confidence going forward that they will ultimately, perhaps within two or three years, be able to safely deliver the agency’s astronauts to and from orbit and finally eliminate our dependence on the Russians.